As DonH led the way on last year, the Talk Nats crew should come up with a couple dozen good questions that Rizzo might actually answer. A few rules: 1) He’s not going to tip his hand and reveal any upcoming moves, there is no point in asking “are you satisfied with the team as it stands or are you still looking to upgrade?”. 2) Don’t critique a past move, pass on “was the Adam Eaton trade a mistake?”, the answer is no. 3) Don’t try to be funny, “blah, blah, blah, Tommy Bahama?” is wasting everyone’s time. Here are some initial suggestions, add more in the comments and we’ll have a good list to pass around. Obviously it’s up to Bryce Harper to determine if he wants to come back, knowing that he might not decide until this time next year, how does this uncertainty affect Rizzo’s ability to map out a long term strategy either with or without Bryce? Which NL East team is most likely to make a jump forward and challenge the Nats this year? Does the weak division lessen the pressure on the Nats to improve the team during the off-season vs waiting until mid-season? Does a regular season division battle better prepare the team for the post-season than a 10-20 game lead? The Mets are pushing the Nats’ AAA team out of Syracuse, any plans on whether to accept the move to Vegas, to try to bump out another teams’s AAA club, or something more creative? Which injured player is Rizzo most interested in seeing on the field in February? A couple years back the Nationals overhauled their medical staff in response to a flood of injuries. Last season the team was near the top of the league in games lost. Are injuries just bad luck or is there an action that can be taken to reduce the impact of injuries in 2018? Is there any concern that the earlier start in March might lead to more injuries from playing in colder weather? Weeknight games routinely ending after ten can be a hardship on the fans, would a pitch clock shorten the games and how can a clock be enforced when the hitters step out after every pitch? Will the extra days off result in more starts for the aces and fewer starts for the bottom of the rotation, lowering the value of the fifth starter? Would automated ball and strike calls enhance the game by removing the ump from the competition between pitcher and hitter? Replay has been a big topic for several sports leagues, affecting pace of play, could MLB reduce the impact by limiting the number of incorrect challenges per season, eliminating those late inning “use it or lose it” long shot reviews? Would Rizzo agree to a road trip to Mexico or London in the next couple years? With Kevin Long coming in as hitting coach are the Nats embracing the trend to instruct players to upswing and barrel the ball? The team up the road used to have an organizational strategy called the Oriole Way, which meant consistent instruction at all levels of the minors, does turning over the coaching staff at the major league level every couple years make it difficult for young players to learn the Nats’ club philosophy? Davey Martinez has never managed a team and he’s now taking over a World Series contender, if he struggles early what support is staff in place to help him keep the team on track? Immediately after the blown call in game five last year, Davey Martinez said that he spoke on the phone with the Cubs rules guru so that he knew that the Cubs had benefited from an umpire mistake, do the Nats have anyone in a similar role to look up rules during the game and communicate them to the coaching staff? On the 21st, the Nats will be the last team in MLB to hold their first team workout of the spring, with a new coaching staff wouldn’t it be better to get an earlier start? With the expanding number of advanced stats available, is it difficult to separate trivia vs information that leads to strategy to increase the win total? Is there a danger with advanced analytics that managers feel the need to follow the numbers at the risk of being second guessed if a gut call goes wrong? The Nats have made frequent trades with the As, how important is it to build up a level of trust with opposing GMs while at the same time trying to get the better of the deal? How does Rizzo balance the long term impact of trading (or not) a top-tier prospect who is almost ML ready against the possibility that there might very well be an opening as a starter soon? 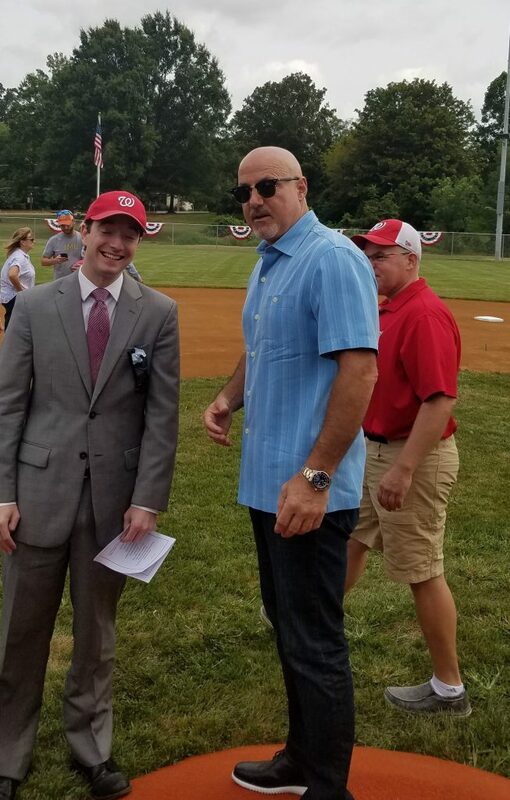 At WinterFest Rizzo was quoted saying that the Nats were under the CBT for 2017, which conflicts with media reports, what is the story there, where the Nats under the cap? Follow-up: There is a rumor that the Nats disagreed with the MLB methodology on calculating the total payroll, is there any truth to this and if so what was the basis of the disagreement? Will the era of deferred contracts fade away as they can cost the team in CBT fees? How much is the slow free agent market a result of the CBT vs the big name players available next year and/or smarter GMs? With the CBT keeping free agent salaries down would that make it more common for players (like Turner) to sign extensions prior to hitting free agency? After a number of years building a very good team, how important is a World Series win for Rizzo’s personal legacy in Washington? This entry was posted in MikeRizzo and tagged Bryce Harper, rizzo. Bookmark the permalink.